In order to understand how whales are using Geographe Bay, we will be tracking animals’ movements visually using a theodolite. A theodolite is traditionally a surveying instrument: it measures angles in the horizontal and vertical planes, and is typically used to reproduce scale models of the landscape. However, it can also be used to observe and measure the direction, distance and position of objects out at sea. 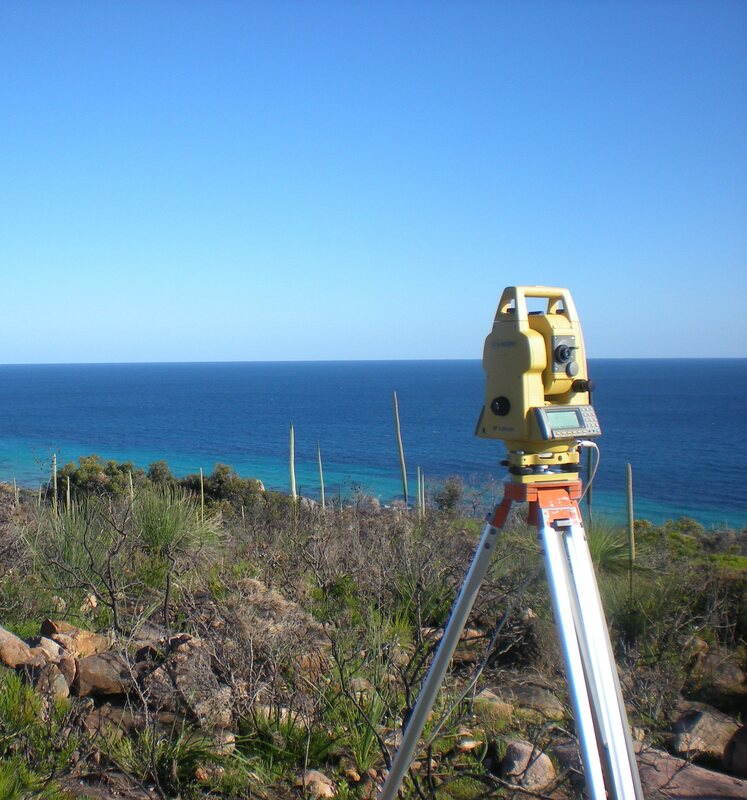 The theodolite is placed at a high vantage point overlooking the survey area: in our case, the hill behind Pt Picquet is the perfect location to look for whales travelling through Geographe Bay. From this position, we can use the theodolite to measure angles from a reference point to a whale. At the start of each shift, we record the position of our reference point (located at the slipway in Eagle Bay). 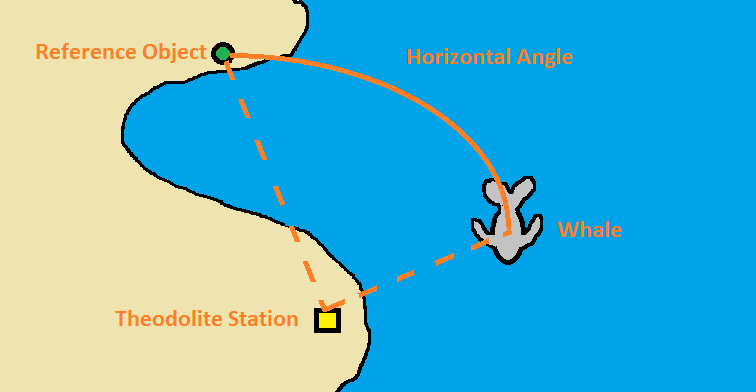 When we see a whale, the theodolite measures the horizontal angle from the reference point to the whale (Fig. 1), which tells us which direction the whale is in. The upwards or downwards tilt of the theodolite telescope gives us a vertical angle – since we know the height of the hill the theodolite is on, we can then use the vertical angle to calculate the distance to the whale (Fig. 2). Because the theodolite angles are so precise, we are able to calculate whale positions in the bay with extreme accuracy. Of course, you could argue ‘Why go to all this effort? Instead of calculating angles you could follow the whales in a boat with a GPS system – easy!”. Good point! Unfortunately, when boats approach whales too closely or follow them for prolonged periods, there is a risk that the whales will change their behaviour. The humpback whales which are passing through Geographe Bay are south-bound, migrating from their breeding grounds in the Kimberley region to their feeding areas in the Antarctic. As the whales do not feed during migration, this means that they are living off their fat reserves. Since these animals have not eaten for the last eight months, it means their fat reserves are getting pretty low! Therefore, it is critical to avoid stressing the whales or causing them to engage in costly behaviours – such as swimming faster, deeper or more erratically to escape bothersome boats! As the theodolite is operated from land, it provides a remote, non-contact method of studying the movement patterns of whales. We can see them, but they can’t see us! Therefore, the whales’ are able to continue their normal behaviours with no disturbance – which benefits them in terms of energy, and us in terms of good data. The theodolite is linked up to a computer running the Cyclops program. Cyclops is a marine mammal positioning system developed by Dr Eric Kniest from the University of Newcastle, NSW (http://cyclops-tracker.com). This computer program is specifically designed to accurately locate and record marine mammals and other objects from a known location. It takes data from the theodolite and creates real-time tracks of the whales we are tracking. It also allows us to record additional data, such as group composition, whale behaviours, weather observations, and manual sightings from reticule binoculars.